Before I get into the run, I wanted to post a picture I took last night walking through Central Park. It’s a shot of the spotlights representing the World Trade Center towers in memory of 9/11/01. I took it from the top of the Great Lawn and, while the picture quality is mediocre, I recommend heading out there tonight (weather permitting!) for the view. It was truly breathtaking and reminded me of some painful times and gave me a boost of gratitude that I get to live a happy life doing so much of what I want to do on a daily basis in the greatest city in the world. 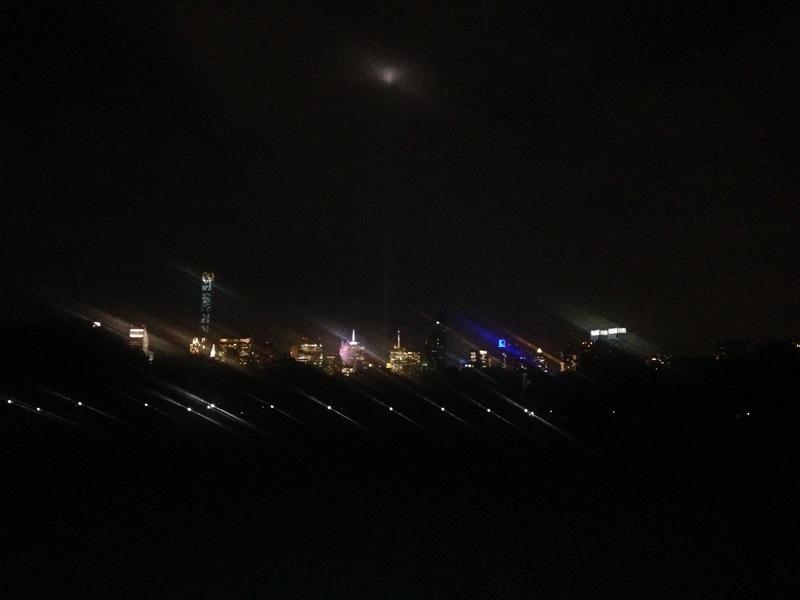 World Trade Center Spotlights as seen from the top of the Great Lawn. Mediocre picture of a breathtaking sight. I also wanted to say that I’ve posted my training plan for the many races I’m scheduled to run. I’m working on the formatting, and welcome feedback not only about the layout of the page, but also about the plan’s contents. The plan will change based on life, ability, and other races added into the mix, but I think it’s a cool idea to get it out there and keep a record of what I’m up to in a given week, and what’s coming. It adds accountability to my training, and provides opportunities to talk about what works, what doesn’t, and how to improve. We New Yorkers have had a fortunate weather streak. While the temperature has exceeded 90 degrees many days, we have not gotten much rain. This has made for sub-optimal (but bearable) summer running weather, often requiring a slower pace and frequent water breaks. Today, however, that streak ended, and I bounced out my building door into light drizzle and cooler temperatures. As someone posted on Facebook yesterday said, “With that one storm burst, the season magically changed from summer to fall.” Yes, summer officially ends on September 22, 2015, and I will hold out hope for continued warmth; however, the seasons are a changin’, and soon enough we’ll all be pulling our long tights and long-sleeved running shirts out of the corners of our dressers. This morning’s run was frustrating for two reasons. First, while my friend and I used to run an editorial music website almost eight years ago, I consider myself a newbie to blogging. That said, as pictures are an important part of any post, I am trying to remember to take pictures during my workouts. This morning, however, I left my iPhone at home so as not to damage it. Thus, no pictures :(. Second, water is kryptonite to my Fitbit Charge HR. I can sweat all over it, but rain, pools, and showers can destroy its functionality. While I wore the heart rate monitor for portions of the run, I had to remove it whenever the rain intensified, which meant I wore it for maybe 40% of the run. I am confident that I remained in my aerobic heart rate zone, but it’s always nice to have certainty. On the positive side, the rain kept me cool, and it wasn’t coming down so heavily that I could not see or that I had to slow my pace. The roads seemed slightly emptier, too (fewer cyclists), which made for a nice, quiet morning. I also like running under sub-par conditions because we don’t control race-day weather, so any experience running in rain or heavy winds or extreme heat provides its own special training. I felt strong on the hills, and feel like I’m getting closer to conquering the largest of the Harlem hills at my maximum aerobic pace. And finally, by Thursday I usually need to blow off some steam and, even though this is a shortened work week with Labor Day, it’s nice to pound the pavement and release some of the pressure from work and life in general. Thursday morning appears to be my weekly existential crisis. Running and allowing myself to have perspective on life makes the morning easier. Because I didn’t bring my phone, I also don’t have mile splits. I’ll estimate, though, that I ran the 6.2 miles in around 48 minutes, which equates to a 7:44 minute per mile pace. Makes sense given the hills and the rain. When I first started training with Dr. Maffetone’s “180 Formula,” it would take me approximately 55 minutes to complete a park loop, so there’s some serious improvement over the past two and half to three months.